For China to modernize its economy, it must further industrialize, and urbanize. These two processes are inevitable, but neither can occur without a commensurate increase in energy consumption. Where will this energy come from? Nearly 70% of China’s primary energy is derived from its vast coal reserves — the third largest in the world. 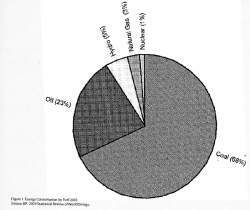 But coal is an aggressive pollutant, and one of the main sources of greenhouse gases. What’s more, most of China’s coal mines are far removed from the centers of economic activity, thus creating problematic transportation bottlenecks. Gas, which is much cleaner, is in limited supply and faces similar geographical challenges, requiring costly pipeline infrastructure. The spectacular car boom, which closely mirrors the rising middle-class, has made China the second largest consumer of oil in the world (after the US). This has put considerable pressure on supplies, and with imports coming from such countries as Saudi Arabia, the geopolitical tensions are not negligible. Wake up and smell the coal! fed by a reliable source of alternating current at any time of night or day. Twenty years ago these amenities were virtually non-existent in Chinese households — today they are becoming as ubiquitous as they are in the West. A modern society does not experience regular brown-outs, much less black-outs, but if China’s population breaks 1.6 billion by 2050, it will have to add the current power generation capacity of Canada every four years1 to keep the lights on. Managing its gargantuan energy appetite is one of the major challenges China faces in the 21st century. If China’s population breaks 1.6 billion by 2050, it will have to add the current power generation capacity of Canada every four years. Modern industrial societies are underpinned by energy, they are driven by energy, and they can not survive without adequate means to harness and reliably channel its most prominent form: electricity. for nearly 70% of China’s energy consumption. But China’s energy sector suffers from a number of inherent problems:2 firstly, there is a geographical mismatch between supply and demand. The bulk of China’s coal deposits are in the north of the country, while most of its economic activity is concentrated along the coastal regions of the east. attendant on readjusting a national energy mix. For one, China’s domestic supplies of oil and natural gas are limited (in relation to its population) and with international markets in both commodities as tight as they are today the problem easily slips into the geo-strategic sphere: in 2004 Saudi Arabia was China’s top foreign oil supplier — the political sensitivities are self-evident. A third inherent problem relates to the efficiency with which China is converting its energy inputs into, heat, electricity or mechanical energy. Energy efficiency is often related to economic performance by the so called energy intensity which indicates how much energy input is required per unit of GDP. Once a country has passed the initial stages of industrialization, its energy intensity tends to decline. 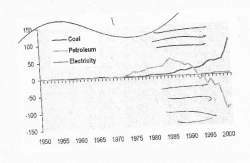 This has indeed been the case in China: the period between 1980-2000 has seen a spectacular decline in energy intensity, but for the past few years a steady rise in China’s energy intensity has suggested renewed profligate energy consumption unmatched by improvements in conversion efficiency. The modernized industries cropping up across the country from Sichuan to Shandong province are expected to reverse this trend in the long-term. Are the industrial mammoths of the Great Leap era still pumping out too much steam, or is it the spiraling energy demand of a rising and richer middle class that is tipping the balance? The question of energy and its relation to China’s progress is complex and multi-dimensional. How China will push ahead without locking itself into an impossible energy quandary? How it will wean itself off coal without ruffling too many foreign feathers as it shops for energy abroad? How it can continue to industrialize, to modernize and to urbanize with the energy sword of Damocles hanging precariously overhead? These are the issues China faces in the coming decades, and these issues will become more and more acute as China’s demographic landscape shifts: over 50% of its population will be living in cities by 2020. Will China’s cities be part of the energy solution or part of the problem? Any discussion of China’s energy begins with coal. Coal is the backbone of China’s energy supply and it has been since the earliest days of its industrialization. Nearly 70% of China’s primary energy consumption (by fuel) comes from coal. The dominance of coal in China’s energy mix becomes particularly striking when a comparison is made with the US: in 2004, coal accounted for just under 25% of US’ primary energy consumption 3. Chinese energy experts entertain no illusions that coal will cease to be the country’s energy mainstay for many decades to come. In relation to China’s sustained economic growth, an energy system’s analyst at the Energy Research Institute in Beijing commented 4: “We have to increase coal consumption. It’s not a good picture, but we have to do it.” International Energy Agency seems to agree, not that it should, but that it will happen: half the increase in global coal use over the next three decades is expected to come from China. Increasing domestic coal production is not an issue. During the late 1990s China even experienced a serious oversupply problem. Large-state owned coal mines as well as small unlicensed mines were developing excess inventory and many of these were even running at a loss. Stepping up coal exports became a means to deal with some of this surplus. The government eventually took measures to close down a large number of these small mines (evident in Figure 2, based on the official record), but anecdotal evidence suggests that many of the “closed” mines continued to operate 5. At least one third of the 80,00 small mines have been opened illegally 6. The output growth in coal output, since 1987, has come almost entirely from collective or individually owned mines (see Figure 2). The rush to open new mines without adequate technical or geological evaluation has led to a tremendous waste in resources, with predictable consequences: destruction of arable and grazing land, the intensification of topsoil erosion and increasing air and water pollution. Moreover, the mines spills dumped in rivers aggravates local floods by raising the river bed 7. China’s largest coal deposits are in the North, while most of its economic activity is in the East and South-central regions. Most of China’s reserves are not where the coal is most needed i.e. where industry is situated as is evident in Figure 3. China’s largest coal deposits are in the North, while most of its economic activity is in the East and South-central regions. One obvious solution would be to produce electricity in the North, where the resources are, export the energy to the South in the form of electricity through high voltage transmission lines, but this ignores another problem: thermal power generation with coal-fired plants requires vast quantities of cooling water, and water is precisely what is in dire shortage in the North (a virtual desert) and while relatively plentiful in the south. Plans for a gargantuan South-North water-transfer scheme, in which water will be channeled from reservoirs in the South (including, eventually, the Three Gorges Dam) over more than a thousand kilometers — crossing the Yellow river — may put the option of exporting power to the South back on the table. China is also pushing the development of various new technologies to convert coal to liquid and gaseous fuels, not only to reduce China’s reliance on coal and its dependence on foreign sources of oil and gas, but also to mitigate the environmental impacts of coal. Sulfur — China’s principal source of air and water pollution — is removed as an integral part of the gasification process i. The world’s first coal-liquefaction plant is being built in Inner Mongolia by the state owned Shenshua Group and is scheduled to be complete in 2008. In 2003, China became the second largest consumer of petroleum in the world after the US. In 2003, China became the second largest consumer of petroleum in the world after the US. Its demand in 2004 stood at 6.37 million barrels per day (mb/d) — global demand was about 82mb/d. With limited domestic supplies of its own, imports have been China’s principal means to satisfy a growing demand. In the early 1990’s China’s imported oil came from a handful of countries, including Indonesia, Oman and Yemen. Today, this list is vastly expanded, with Saudi Arabia, Iran, Angola and Vietnam prominently represented. Foreign equity has also been a channel through which China has sought to satisfy demand: half of China’s current oil production abroad comes from Sudan. Recent unsuccessful attempts to acquire the American oil major Unocal is further evidence of China’s outspoken ambitions in this arena. The spectacular emergence of the automobile in the Chinese economy has intensified China’s affair with oil. 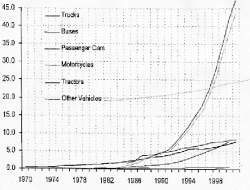 From 1990, within a decade, the market for passenger cars grew by a factor of 10. This growth was further galvanized by China’s entrance into the WTO in 2001, which spurred local car manufacturers to launch a price war aimed at curbing competition from abroad in anticipation of lowered tariffs 8. And many more vehicles are on their way. The current figure of about 24 million is likely to rise to about 90-140 million by 2020; in terms of oil demand, transport would account for 57% of oil consumption compared to 33% today 9. China’s thirst for oil will not be quenched any time soon: the IEA predicts demand will exceed 12 million barrels per day by 2030 (see Figure 6); by contrast, the US currently consumes about 20 millions barrels per day. It is important to note that over 70% of China’s oil will come from imports by this date, exacerbating the geopolitical tensions already manifest. Whether this level of growth in China, alongside that of other energy hungry economies such as India, can realistically be satisfied is outside the scope of this essay. Suffice to say that the capacity of global oil supplies to meet expected global demand in the coming decades is currently the subject of vigorous debate. The jury is still out, and perhaps, ultimately, the verdict will not come in the form of projections from the analysts and economists of the world’s energy agencies, but far more curtly from real and possibly unmanageable supply shortages. One question on which most commentators seem unanimous is the increasing importance of natural gas. The largest future growth in terms of fuel share in China is expected to come from this hydrocarbon, particularly for the generation of electricity, currently dominated by coal. The principal reason is environmental. Emissions of green house gases and other pollutants, such as sulfur oxides can be significantly reduced. Natural gas is also vastly more efficient. Modern gas-fired combined-cycle plants can convert about 60% of the energy contained in natural gas into electricity. By contrast, coal-fired plants convert only about 40%. In natural gas lies the potential to make China’s electricity generation greatly more efficient. Another very important reason for further diversification of China’s fuel mix are the transportation bottlenecks that have arisen from coal, in particular since 2002 following the steep rise in demand for coal. As mentioned in the introduction, China suffers from a geographical mismatch between its energy resource concentrations and its centers of economic activity. This is also the case for natural gas: China’s gas reserves are as far if not further removed from the large cities of Shanghai, Beijing and Guangzhou as are its major coal reserves. China’s largest deposits of natural gas are located in the western and north-central provinces. Of course, the difference is that gas transport by pipeline is virtually instant, if the infrastructure is in place. 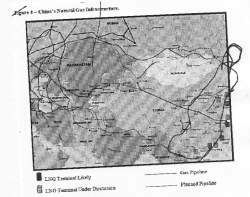 The 3900 km West-East pipeline, that connects western Xinjiang province to Shanghai, delivered its first cubic meter of natural gas in 2004. The project cost $24 billion dollars and was a wholly Chinese undertaking (planned participation from Shell, Exxon-Mobil and Gazprom fell through) 10. Natural gas faces an important commercial barrier: it remains expensive relative to coal, certainly without the inclusion of environmental costs. The perception of this high costs dampens demand. As indicated by Jeffrey Logan, China Program Manager at the IEA, in his testimony to the US senate in February 2005 “[w]ithout strong market pull for gas, the entire natural gas chain will remain weak, no matter how much government tries to develop the market by administrative dictate”. Further demand for natural gas would provide the needed impetus to invest in upgrading the fragmented infrastructure, and to fill the knowledge gap that exists regarding how best to develop the natural gas market. While hydroelectric power represents only 5% of China’s total energy consumption, China stands unrivalled as the world’s greatest producer of hydroelectric power. Of the 45,000 large dams in the world, 22,104 are in China, 6,390 are in the US and 4,000 are in India. The most notorious of its hydro projects is of course the Three Gorges Dam on the Yangtze river. With 26 separate 700MW generators giving a total capacity of 18.2GW (about eighteen large nuclear power stations), it is a symbol of China’s technical prowess and an object of great national pride. Equally, however, critics have heaped endless scorn on the project, claiming its aims are irreconcilable with the scale of the environmental impact: six hundred square kilometers of water from Wuhan to Chonqing is impounded primarily for the purposes of generating electricity; the displacement of people to make way for the project runs to 1.8 million 12. At least two more dams on the scale of the Three Gorges are planned for the Yangtze in Yunnan and Sichuan province. The aim is to double China’s hydropower by 2010 13. A 25-station project with a combined capacity of 15.8GW is being developed on the upper portion of the Yellow River. The environmental impact of China’s hydro development is particularly evident on this river, the downstream portion of which has been reduced to a trickle for most of the year, exacerbating the already chronic water shortage problems in the north. Draughts are endemic and desertification yearly sends dust storms sweeping East from the Gobi dessert to Tokyo and as far as the US’s western seaboard. The construction of small hydro-stations has been an important application of energy conversion technique in China. The initial thrust came during the water conservancy efforts of the Great Leap Forward. A total of 900MW was planned by 1958; although the endeavor was aborted when the Great Leap collapsed, small hydro remains significant contributor to the electrification of rural China. Nuclear power accounts for only 1% of China’s energy consumption. Yet, China’s nuclear program is not young. Its program started in the late 1980s. There are three stations in operation, with a total capacity of 6.1GW, all on the eastern coastal areas. It is expected this capacity will be greatly expanded, on the order of 2GW (i.e. 1 to 2 new power stations per year for the next 16 years). A giant step in that direction will be the 6GW nuclear complex planned in Guangdong province, to be operational by 2010. New capacity will largely be replacing old coal-fired power stations that will be gradually retired. Nuclear may become competitive with coal especially in the East of the country when the added costs of coal transport, desulfurization equipment and the rising cost of coal itself are factored in. The high capital cost of nuclear power generally keeps private investors at bay, thus nuclear power remains largely a state enterprise. Despite its small showing, non-hydro renewable energy has not been ignored in China. It has enjoyed a great deal of attention at national energy policy level. At the same time, renewable energy has so much ground to catch up before it can make even a small difference in China’s energy mix, that it can only be considered in the context of a long-term energy strategy. Predominant renewable energy in China includes, wind, solar, geothermal and biomass. Together, they account for less than 1 percent of China’s energy mix ii. Wind already has a fairly good footing in China both in terms of installed capacity as well as domestic expertise. In fact, China has some of the best wind resources in the world, particularly in Inner Mongolia and the north western regions in Xinjiang province, with an estimated exploitable wind resource in excess of 250GW 14 (that about 250 nuclear power stations). By 2002, 30 wind farms had already been installed with a total capacity of 468MW. And targets are to reach 20GW of installed capacity by 2020 15. To put this in perspective, total combined power generation capacity in 2002 exceeded 300GW. Establishing new technology goes beyond merely installing hardware. A domestic industry and a knowledge base need to be in place. Capacity building efforts, with foreign involvement (including the UN and the World Bank), have been pushing in that direction. Nevertheless, renewable energy still has a very long way to go before it can start to allay China’s energy and environmental ails. China has been growing at a feverish 9% per year and is set to become the world’s largest economy within two or three decades. The ratio between the total primary energy consumption and GDP is a country’s “energy intensity” (EI); it indicates how much energy is needed to produce a unit of GDP. The idea that economic growth must be accompanied by growth in energy consumption will seem intuitively correct; the question is whether the growth in energy consumption is greater or less than economic growth. Generally, as a country develops, energy is used more and more efficiently and thus energy intensities will tend to decline as less energy is needed to produce the same unit of GDP. Looking at China’s energy intensity, particularly over the last 20 years (up to 2002), it has indeed been declining. However, this has not always been the case. During the 1950’s, a Stalin-style expansion of energy intensive heavy industry led to a predictable rise in the EI. The subsequent rapid decline reflects the collapse of the Great Leap Forward, followed by the instability of the Cultural Revolution, but China’s EI resumed its steady rise after these events. The turning point came with the reforms of Deng Xiaoping: from the country’s EI fell by 30%. This was the result of the combination of wholesale closure of old, inefficient factories, and the introduction of new technology. The EI continued its decline with a virtual free-fall between 1995 and 2000 of nearly 45% iii. Over the last few years, however, this trend seems quite surprisingly to have been reversed. The energy elasticity of demand (the ratio of the growth rate of energy consumption over the growth rate of GDP) is another way to examine energy intensity. The value of this index has been about 0.5 for China for quite a number of years, but in 2004, following 2 years of rising energy intensity, it exceeded 1.5! (i.e. growth of GDP: 9%; growth in energy demand: 15%). In Figure 10 it is possible to see the beginning of this trend with a leveling off of the energy intensity in 2001. Leaving aside the debate over the statistical validity of current values iv, the recent overall upwards trend may reflect a regression in energy efficiency of China’s economy, which, if persistent could have significant consequences on the course of China’s development and on its environment in the short term. In the long term, however, as China moves towards a less energy intensive industry, the energy intensity of its economy will decline. The breakdown of energy use by sector in Figure 11 provides a clear sign that China’s energy intensity can potentially be greatly reduced as its industrial sector accounts for nearly three quarters of total energy demand. And given that growth in other sectors relies on a supply of manufactured good from the industrial sector, the latter is set to remain the dominant energy consumer in China for the foreseeable future 16. Note that residential and agricultural demand for energy represent a relatively small proportion of total energy consumption. To manufacture a ton of steel requires over a ton of coal. China makes more steel (as well as other high energy products such as cement) than any other country in the world. More than 50% of the growth in both steel and cement production in the world between came from China 17. This explains the vast energy appetite of China’s industrial sector. An important section of Chinese industry is in the form of TVEs (township and village enterprises). TVEs have been shown to be very heavy consumers, and largely inefficient, however they constitute an integral part of the Chinese economy. Small and medium scale small enterprises, for instance, produced 80% of cement output, but because of their inefficiency, the tendency has been to close down as many small plants as quickly as possible, in favor of further centralization. A word of caution against dismantling this longstanding economic structure might be that small, but technically advanced plants in industrialized countries are equally if not more efficient than their larger counterparts, in addition to the fact that they bring added flexibility 18. Characteristic of the most intensive stages of industrialization is the demand for electricity growing faster than the total demand for all forms of commercial energy. Growth has been such that demand for electricity more of less doubles every decade (see Figure 9; consumption is matched by generation capacity, see Figure 13). In the first half of 2004, 24 out of China’s 31 provinces experienced blackouts. Suspension of power transmission to certain enterprises to prevent blackouts in residential areas was not uncommon. The growth rate in demand for electricity has been in the order of 9 to 10% in recent years While investment in new power generation facilities has been lagging, investment in energy-hungry metallurgy, building materials and chemicals industries has been growing rapidly, completely out of step with lead time to build the necessary generation and transmission infrastructure 19. In the first half of 2004, 24 out of China’s 31 provinces experienced blackouts. The Chinese government continues to aim to increase the country’s generation capacity, from its level in 2003 of 385GW to nearly 500GW by the end of 2005 20. Distribution and transmission capacity will have to be upgraded accordingly. The residential energy use is relatively small compared to industrial consumption, but it is expected to rise dramatically as more and more Chinese move to cities and equip their homes with televisions, fans and, especially, power-hungry air-conditioning. Room fans and air-condition have indeed shown the steepest rise in recent years (Figure 14). The potential for efficiency gains on the residential front are enormous. Small improvements in homes and home appliances are magnified several millionfold.. The potential for efficiency gains on the residential front are enormous. Small improvements in appliances are magnified several million-fold. Refrigerators are particularly amenable to improvements. 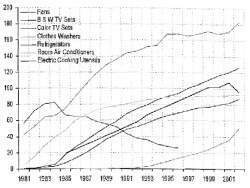 In the late 1980s China exceeded the US in the production of refrigerators, but insufficient thermal insulation, inefficient compressor and low quality gaskets made the Chinese models about 50% less efficient 21. Wall and ceiling insulation, and double-glazed windows are not typical features of Chinese apartments today. Enormous contributions to energy efficiency could be made by fiberglass and thermostats alone. Improvements which would significantly contribute to a lowering of China’s energy intensity. Some commentators have gone so far as to say that the most important issue to be addressed in the coming years is not the question of possible oil supply shortfalls in China, but rather the efficiency of China’s power sector, in particular the generation, pricing and transmission of electricity 22. As demand for electricity continues to spiral up, a robust regulatory framework will have to be in place to provide a transparent pricing mechanism, certainly as interconnection between grid networks increases and as the utilities shift from public to private hands. Without such a framework it is possible that much needed private investment will not be forthcoming. Moreover, with rapid urbanization, China’s changing pattern of domestic energy use will lead to sharp increases in electricity demand, a further factor militating in favor of greater coherence and efficiency in China’s electricity market. 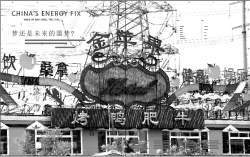 Since 1992 China has had no Energy Ministry responsible for formulating national energy policy. Uncertainty and incoherence is a problem not exclusive to China’s power sector. The energy sector as a whole suffers from a lack of consistent long term policy; this is reflected in the shifting nature of its institutional structures v. Since 1992 China has had no Energy Ministry responsible for formulating national energy policy. Institutions have been created — it seems — almost ad hoc, often to be dismantled some years later. Until the mid 1990s, responsibility for energy-policy was effectively devolved to a small number of very large state-own companies; they reported to the State Planning Commission (SPC) and the State Economic and Trade Commission (SET). Approval for all major investments and energy prices required SPC approval. In 1998, with the beginning of a major restructuring of China’s large energy companies, the energy portfolio was handed to three separate institutional bodies, including the Ministry of Land and Resource. The structure changed again in 2003 with the creation of the Energy Bureau under the National Development and Reform Commission. Though a worthy move to centralize energy policy, the Energy Bureau was not given the muscle it needed: it is currently staffed by about thirty people, a comparable body in an OECD country would have hundreds if not thousands 23. Possibly in recognition of this problem Beijing announced in March 2005 that a national leading group under the State Council would be given the energy sector portfolio. Despite China’s one-party system of government, it has shown hesitance in the centralization of certain expertise and responsibilities, leaving many pressing problems and planning issues unaddressed. When growth in sales hit a bonanza level of 75% in 2003, Beijing felt it had to step in to tighten credit rules on car purchases. Sales slumped a little subsequently, but China was nonetheless the third largest automobile market in the world in 2004 with 5 million cars sold (US: 17 million). Because of China’s immense population, the per capita translation is less impressive: 7 or 8 out of every 1000 people compare to the US’s average of 600. But that number is rising quickly, and it is anything but geographically uniform. Beijing, for instance, a city of 12 million, has 2 million cars 24. The Chinese seem bent on following the American model, with each family owning a car. This could mean in the order of 300-400 millions new cars (the total global fleet is currently about 500 million registered vehicles). Bicycles that used to fill the streets of all major cities are slowly but surely being relegated to the scrap heap. Shanghai, to great furor, even dared ban bicycles from its main streets to make way for its growing middle class of inexperienced drivers (the accident rate in China is abominable). China has followed a different course in the development of motorized mobility than its Asian neighbors, where the share of motorcycles per capita reached much higher levels before the personal car began to make significant inroads. More disposable income and easy loans facilitated by a government keen to see the car industry become one of China’s economic pillars have helped to drive this economic boom. But cars have also become a means to adapt to a quickly changing urban environment: designated government housing close to one’s place of work is an arrangement that is quickly vanishing. The housing sector is becoming increasingly privatized and the old state-owned factories have either been shut down or moved out of cities, often beyond the reach of public transportation. Furthermore, the government’s involvement in promoting the car industry cannot be overstated. What happened in the US during the ‘20s and into the ‘50s, when the interstate highways were built, is occurring in China virtually within a single decade. China had 34,000 km of motorways in 2004, more than twice the 2000 Figure (and it had virtually none in the late 1980s). Its network is currently the third largest in the world, with half of it built in the past 15 years. By 2020 it is expected to double in size 25. The toll will be further loss of arable land, rising photochemical smog, and degradation of the urban environment. China’s remarkable development over the past four decades has unfortunately entrenched a much longer history of environmental abuse and neglect. From air pollution and water contamination, from widespread deforestation and the erosion of arable land, from acid rain and loss of biodiversity, China has reached calamitous levels on virtually every front. Although Beijing formally recognizes the extent of the degradation, and some important measures have been put in place to redress the worst mismanagements, the imperatives of China’s economic goals still prevail unequivocally over environmental concerns. China’s GDP quadrupled between 1980 and 2000. The plan is to repeat this feat by 2020. The nation’s already tattered ecosystem will undoubtedly suffer more and perhaps greater insult during this period, deepening the economic impact of China’s environmental degradation, currently estimated at 5 -15% of GDP 26. Efficiency improvements evident in China’s declining energy intensity, coupled with a shift of industrial activity from heavy industry to light industry are encouraging signs. But will China be able to raise the standard of living for its growing population without doing irreversible damage to the very ecosystem that will have to provide the primary inputs to sustain its improved quality of life? Water shortage is probably China’s greatest environmental challenge. In absolute terms China’s water resource is not inadequate. It ranks sixth in the world, but in per capita terms China falls to about a quarter of the global mean. 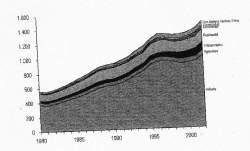 The consumption trend of the last fifty years runs from about 100 Gm3 in 1949 to about 557Gm3 in 1997; official projections for 2030 are: 664Gm3, not far from the estimated total available volume of 800-950Gm3. Moreover, as with its energy resources, a highly uneven distribution of precipitation makes China’s northern provinces (outside the zone of strong monsoon rains) particularly water strained. At the same time, this region contains about two fifths of the population and produces a proportional amount of the nation’s grain output. Irrigation dominates the China’s water use in a manner that does not reflect the level of scarcity. Beijing residents used to pay flat rate amounting to about 10% of real cost; this was revoked in 1996, after which water prices were raised. Yet water for irrigation, which accounts for 80% of water use (50% in Beijing municipality), has remained virtually free. The urban impact on water resources is also severe. Beijing’s reservoirs currently contain less water than at any time since the 1980s. And the Ministry of Land and Resources has warned that a mega-funnel of receding groundwater has formed over an area as large as 40,000 m2, resulting from the convergence of separate funnels underneath Tianjin, northern Henan and western Shangdong. Beijing’s water table has dropped 9 m since early 1980s, and this effect is even greater in parts of the North China Plain 27. Not only is water scarce, but it is usually contaminated as well. Half the population or a little over 600 million people have water supplies that are contaminated by animal and human waste. In July of 2004, on one of China’s seven biggest rivers, the Huai, a dark, noxious plume, stretched 133km downstream killing most fish in its path. Too much water extraction compounded by excess dumping of untreated waste were cited as the root causes. China’s State Environmental Protection Administration (SEPA) found that over 70% of the water in five of China’s seven major rivers was unsuitable for human contact. This problem is likely to become increasingly acute as more people move to cities. In 2004, only 20% of China’s 168 tons of solid waste per year was disposed of adequately 28. The air quality in China is equally dramatic. The following figures speak for themselves: Beijing’s mean annual total suspended particulate (TSP) level is about 500µg/m3. The World Health Organization recommended maximum to be exceeded only 2% of the year is 150µg/m3! Some cities are even worse 29: Mudanjiang in Heilongjiang, Langzhou in Gansu have mean annual TPSs of 600µg/m3. The World Bank estimates that China has 16 of the world’s 20 most polluted cities. Coal is the principal culprit, in particular with regards to sulfur dioxide emissions. Soon, hundreds of thousands of cars will be adding great swathes of photochemical smog to the mix. The list goes on: the cumulative loss of arable land due to erosion over the past forty years has exceeded the totality of farmland available in all of Germany, while China, with 21% of the world’s population in the year 2000, had only 9% of the world’s farmland 30. To blame are, among other factors: urbanization and the encroachment of enterprise and large infrastructure projects, such as the Three Gorges Dam. The margin between demand and the supply available from China’s natural resource base is much narrower than in most other countries. This makes the proper management of this resource base critical. In 1998, the SEPA was raised to ministerial level, environmental spending was increased, and the 10th Five Year Plan was promulgated setting ambitious targets for emission reductions. But its implementation is proving difficult in a sprawling, centralized bureaucratic structure. Analogous to the effete Energy Bureau, the SEPA remains largely understaffed, and forced to vie for influence with other agencies such as the Construction Ministry that deals with water and sewage treatment. This competition stifles SEPA at ministerial level, while at the local level, on the ground, in SEPA’s many branches around the country, corruption makes enforcement very difficult 31. The book of China’s environmental abuses makes a long and rather alarming litany, and when it is not accompanied by a list of improvements and mitigation measures put in place in recent years the outlook seems unquestionably bleak. Beijing understands the scale of the challenge, but at the same time if it is to raise the country’s standard of living it must stay the course of industrialization and that means increasing resource consumption, which means more pollution, more water extraction, and more erosion of land. If it must be done, the key will be to do all of these things as efficiently as possible with the least detriment to the environment. What does raising China’s standard of living mean in energy terms. Is it possible to identify a minimum yearly per capita energy consumption level required to achieve a quality of life that would be deemed acceptable by Western standards. And what is acceptable? There is no one single indicator that encapsulates quality of life. However, infant mortality, average per capita food availability or levels of enrolment in higher education, for instance can be used as proxies for what is experienced as quality of life. In the case of infant mortality, it is possible to achieve levels comparable to those in Italy, the US and Canada, at per capita energy consumption equivalent to about 2000 kg of oil equivalent (kgoe) per year (on the lower boundary). 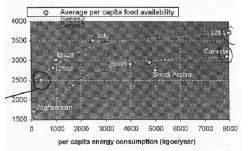 Average per capita food availability follows a similar trend: 2000kgoe/year is about the turning point beyond which diminishing returns become evident. Italy has about the same level of food availability and the same level of infant mortality as the US for about a third of the energy consumption! The United Nations Development Program combines four quality of life indicators in its Human Development Index. Here, once again, the same pattern emerges: 2000kgoe is about the level beyond which a fairly level quality of life is achieved based on the criteria of life expectancy at birth, adult literacy, combined educational enrolment and per capita GDP. Each country clearly has its various cultural, environmental or economic reasons for being more or less energy efficient vi and thus there is an range within which the various developed economies are situated with Canada and the US at one end and the European countries (largely) at the other end. Within that range, quality of life can not be said to vary appreciably. What can be said, however, is that 2000kgoe seems to be about the minimum yearly per capita energy consumption needed to reach the level of economic security, physical wellbeing and access to education typical of developed countries. China’s per capita consumption in 2002, was about 800kgoe/year; this is more than twice the level in India, but only about half the global mean, and about a fifth of the Japanese level. To reach the threshold of 2000kgoe within the next few generations, given the expected increase in population, China’s total energy consumption will have to increase by a factor greater than 2.5. This means that China’s total primary energy consumption will start to be on par with US’, making China a challenger for the top spot as the world’s greatest energy consumer vii, and hence potentially the greatest polluter in the world. Unquestionably there will have to be a trade-off between environmental conservation and quality of life in China, and the balance will be a very precarious one, indeed. In 2003 over a quarter of total primary energy was consumed by buildings, through heating, air conditioning, ventilation, heating water, lighting, cooking, operating appliances, and running elevators. A total of 230Mm2 of energy saving buildings was built by the end of 2002, but that represented only 2.1% of urban building area. The rest of China’s stock of buildings is backward in energy efficiency terms: in comparison to developed countries energy consumption for heat per unit of floor is about 3 times greater in China. This translates to excessive use of both heating and air-conditioning to compensate for this (heating and air conditioning accounted for two thirds of the total consumed by buildings): the peak load for air-conditioning was about 45GW, which is equivalent to about 2.5 Three Gorges Dams, a tremendous energy consumption that could easily be reduced by adequate energy conservation measures. This problem will only increase if is not tackled today. The building area built by 2020 will be double that available in 2000. By 2020 energy consumption from buildings could be as high as 1089 mega tons of coal equivalent (Mtce), three times current levels and equivalent to two thirds of China’s total current primary energy consumption viii. By 2020 energy consumption from buildings could reach three times current levels — equivalent to two thirds of the total current energy consumption. In China’s 2004 energy strategy document, it is estimated that energy conservation measures could reduce this value by over a third. Moreover, in terms of reducing greenhouse gas emissions and mitigating the environmental impact, this same study indicates that both Chinese Academy of Social Sciences and the Chinese Academy of Engineers have identified the energy development strategy of “enforcement energy conservation measures” as requiring the least investment compared to other strategies including clean coal, renewable energy and nuclear power options. Energy conservation extends much further than buildings alone. Transport obviously is another area in which enormous growth in energy demand is expected in the coming decades. The choices made with regards to transport will directly impact the manner in which new as well as older urban centers evolve in China. The extent to which the personal car, in particular, is promoted as the primary means of urban mobility will play a key role in shaping urban China. The relation between urban density and the yearly per capita gasoline consumption in Figure 19 cogently illustrates the influence of urban configuration on energy use, in particular oil for purposes of mobility. Diminishing returns limits the effectiveness of urban density of this process beyond a certain point, but certainly up to urban density levels achieved by most European cities the reductions in per capita gasoline consumption are tremendous. Expanding and modernizing the public transport infrastructure should be a key objective of China’s energy conservation plan; the subway is the fastest and most efficient mode of transport for cities of more than 2-3 million people. Beijing, for instance, would have done better to improve its circular line rather than expand its multilane ring-road, now a major source of congestion and smog 33. Inter-city transport, could benefit tremendously from a network of high-speed trains: this would not only reduce the need for personal cars, and hence the China’s increasing dependence on foreign oil, but it would limit urban encroachment on China’s limited supply of arable land — suburban sprawl being the inevitable outcome of highly motorized urban centres. The rush towards industrialization in China has occurred with little to no regard for the process of urbanization. It seems urbanization has been viewed more as a consequence to be managed rather than a parallel and very important process to be steered and organized. Large factories are cropping up somewhat haphazardly around the country, attracting thousands of workers who are settled in temporary housing facilities on or near the site. Ad hoc civil infrastructure is often put in place to accommodate the transportation requirements of industry. This process, if left to evolve of its own accord could lead to extremely inefficient, low density, highly motorized semi-urban arrangements requiring disproportionately large quantities of energy and resources, a nightmare for a country that already today is struggling to secure its energy supply and maintain the integrity of its ecosystem. Historical perspective demonstrates that it takes a long time — usually half a century — for a new source of energy to capture the largest share of a market. Complex energy systems are like species: they do not transform overnight to adapt to external disruptions, they evolve slowly. There is tremendous inertia to overcome, physical as well as technical and commercial before a new source of energy and its attendant technology takes the fore. China will be a coal-fired economy for many more decades. Even if it reduces coal’s share in the total primary energy consumption to 50%, within the next 20 years there may still be growth in coal production simply because China’s energy needs will continue to rise as the country pushes to full industrialization. On the supply side, the infrastructure will be slow to respond as well: there are thousands of small collective and community-owned mining operations that depend on China’s coal economy for their livelihood. For many miners the switch to natural gas will mean they will have to find something else to do. The social consequences of such a transformation are not to be underestimated; if it is poorly managed and China’s miners are left by the wayside civil unrest is almost guaranteed. But efforts at rapid nation-wide penetration of natural gas will be significantly hampered by the enormous investments required to upgrade China’s fragmented pipeline infrastructure on a macro level, and expand its intra-city network (for cooking and space heating), on a micro level. Moreover, future imports in the form of liquefied natural gas will require very expensive terminals and custom built tankers. Expanding oil supplies, to satisfy, in particular, the transport sector will continue to be a critical component of China’s national development objectives. It seems China has taken keenly to the idea that a middle class is not a middle class without a commensurate fleet of personal cars — ‘commensurate’ in China means hundreds of millions. And cars are useless without roads, which mean further infrastructural encroachment on a dwindling supply of arable land. Renewable energy has been given only a cursory review in this essay because its contribution remains plainly miniscule; a furious effort to expand renewables would have to be launched for them to make a difference anytime soon. The plans now in place centre on wind turbines and biomass plants. Minimizing the impact of its industrialization must be a key discipline in China’s modernization efforts. China faces a very serious challenge, one might say almost a perfect storm: its tremendous hunger for energy comes at a time when fossil fuels are becoming contested commodities at a global level, and issues of energy security are again prominent on political agendas around the world. It also comes at a time when its own ecosystem, after many decades of industrial abuse, has reached a dire state, leaving very little margin for error. It is a conundrum if ever there was one: to improve its condition and prospects, China must consume the very ground beneath its feet, but it must leave enough to stand on. If it does not, it may be forced to spend its hard-earned wealth and prosperity mending a country in continuous disrepair. Cities will be on the frontline in managing the environmental impact. Over half the Chinese population will be concentrated in cities by 2020. That’s more than 700 million people. Many new, smaller cities will be built to accommodate this swell of urbanization. Basic efficiency measures alone would make a tremendous difference, but multidisciplinary planning, co-coordinating industrialization and urbanization, is where China’s future lies. 1.Asia Times On-line, ‘China In An Energy Quandary,’ August 28, 2003. 2.Andrews-Speed, P. ‘China’s Energy Woes: Running On Empty.’ Far Eastern Economic Review; June 2005. 4. Quoted in Nature, Vol. 435; 30 June 2005. 6.Smil, V. China’s Past, China’s Future: Energy, Food, Environment. Critical Asian Scholarship, Routledge Curzon, 2004, p17. 8.Austin, A. ‘Energy And Power In China: Domestic Regulation And Foreign Policy.’ Foreign Policy Centre, 2005. 9.US Senate, Committee on Energy and Natural Resources. Hearing on EIA’s Annual Energy Outlook for 2005. 12.Austin, A. ‘Energy And Power In China: Domestic Regulation And Foreign Policy.’ Foreign Policy Centre, 2005. 16. French, H. ‘In Search Of A New Energy Source: China Rides The Wind.’ New York Times, July 26, 2005. 17. Sinton, E, J. ‘Comments On Recent Energy Statistics From China.’ Lawrence Berkeley Laboratories, October 2003. 18. IEA, World Energy Outlook.Farinelli, U., Yokobori, K., Fengqi, Z. 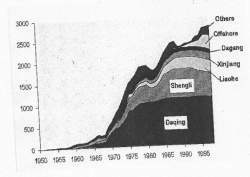 ‘Energy efficiency in China.’ Energy for Sustainable Development, Vol. 5, issue 4,. Austin, A. ‘Energy And Power In China: Domestic Regulation And Foreign Policy.’ Foreign Policy Centre, 2005. 21.Dadi, Z. ‘China’s Sustainable Energy Future; Scenarios of Energy and Carbon Emissions.’ Energy Research Institute & Lawrence Berkeley National Laboratory. October 2003. 22. Smil, V. China’s Past, China’s Future: Energy, Food, Environment. Critical Asian Scholarship, Routledge Curzon, 2004, p.24. 24.US Senate, Committee on Energy and Natural Resources. Hearing on EIA’s Annual Energy Outlook for 2005. 25.The Economist, June 4th, 2005. 27. Smil, V. China’s Past, China’s Future: Energy, Food, Environment. Critical Asian Scholarship, Routledge Curzon, 2004, p.188. 28.Section on water is based on: Smil, V. China’s Past, China’s Future: Energy, Food, Environment. Critical Asian Scholarship, Routledge Curzon, 2004, p.152-167. 29. Section based on: The Economist, August 21st,. Smil, V. China’s Past, China’s Future: Energy, Food, Environment. Critical Asian Scholarship, Routledge Curzon, 2004, p.18. 32. The Economist, August 21st,. Zhihong, W. ‘Economic development and energy issues in China.’ Working paper prepared for KEIO-UNU-JFIR panel meeting. Tokyo, February 13, 2004. 34. Smil, V. China’s Past, China’s Future: Energy, Food, Environment. Critical Asian Scholarship, Routledge Curzon, 2004, p.202. II. An often ignored fact is that at least 10% of China’s total primary energy use come from rural consumption of bio-mass in the form of crop residue and woody phytomass, usually burned as fuel. For a detailed discussion on China’s rural energy flows, see: Smil, V. China’s past, China’s future: energy, food, environment. 2004, p25-45. III. For a detailed discussion of China’s energy intensity and statistical validity of EI data, see: Smil, V. China’s past, China’s future: energy, food, environment; Critical Asian Scholarship. RoutledgeCurzon, 2004. V. more detail see: Stinton, J.E., Comments on recent energy statistics from China. Lawrence Berkeley Laboratory, October 2003. On-line at Sinosphere. VI. See: Andrews-Speed, P. China’s energy woes: running on empty. Far Eastern Economic Review. June, 2005. VII. Japan, for instance, which imports virtually all of its energy will necessary consume less than Saudi Arabia. Harvard University Committee on the Environment: The China Project). Energizing China: reconciling environmental protection and economic growth. Harvard University Press, 1998. Smil, V. Energy at the crossroads: global perspectives and uncertainties. MIT Press, 2003. Smil, V. China’s environmental crisis: an inquiry into the limits of national development. M.E. Sharpe, Inc, 1993. Sinton, E, J. Comments on recent energy statistics from China. Lawrence Berkeley Laboratories, October 2003. China National Energy Strategy and Policy 2020: Energy Efficiency and Conservation. Beijing, 2004.